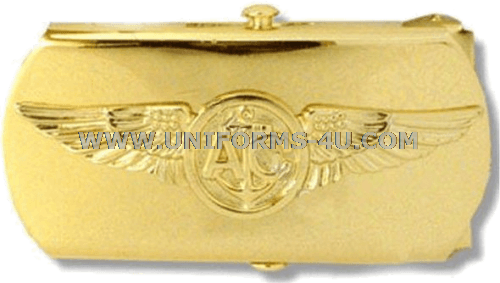 This decorative belt buckle featuring an engraving of the Naval Aircrew Warfare Specialist insignia is authorized by Article 3603.6 of NAVPERS 15665I that specifies that buckles with “appropriate naval insignia, designs, or devices to which the wearer is entitled” is an optional wear item. Only Officers or enlisted Sailors who have earned the Naval Aircrew Warfare Specialist qualification are entitled to wear a buckle with the insignia. The Naval Aircrew Warfare Specialist insignia traces its origins to the Air Crew Insignia that was introduced during World War II in recognition of the contributions of enlisted aircrew flying combat missions, but Officers and Warrant Officers not serving as pilots of naval aviation observers could also qualify for its wear. The original design underwent several tweaks, but in 1958 it was altered radically when it was redesignated the Combat Aircrew Insignia and given a new design. At the same time, a revamped Aircrew Insignia was created, but from 1958 to 1965 its wear was restricted only to Aircrew personnel actively serving in an aircrew position. After 1965, any person who qualified for the insignia could continue to wear it at any time during their military service. In 2009, the Navy announced that personnel serving in Naval Aircrews would have to earn their Warfare qualification, which also gave them the right to wear the insignia. About a year later, the insignia was renamed the Naval Aircrew Warfare Specialist insignia.